Happy 2012! I hope you had a good New Year’s! We had some friends over on New Year’s Day for a very big lunch. The main course? Pork tenderloin with crackling. It was no easy feat to find a butcher willing to sell such a piece of pork with the skin still on it. This is California, after all. The butcher asked repeatedly if we really wanted the skin still on it. He would be happy to remove it. It was really no trouble. But no. We wanted the skin and it stayed. My husband prepped the pork the night before in some way that involved the hair dryer. I didn’t ask. Sometimes you have to leave Brits to their own devices. Sometimes you’re better off not knowing. What I do know: after the pig spent some time roasting in the oven the next day, it was simply gorgeous and my apologies that I had forgotten to take a photo. The skin had transformed into this thick, crunchy, melt-in-your-mouth deliciousness that was indeed cracking good crackling. Blistered, buttery bliss. The crack cocaine of the pig world. We don’t eat like this every day, of course, but once a year, on New Year’s? Hell yeah! And served with stuffing, roast potatoes, mashed carrots and swede (translation: rutabaga), red cabbage and apples, Yorkshire pudding (yeah, I know it’s not the usual accompaniment, but sometimes it’s just what is required), as well as a pavlova with fresh raspberries for dessert, we ushered in the new year with our bellies full and happy, thankful for everything that we have. 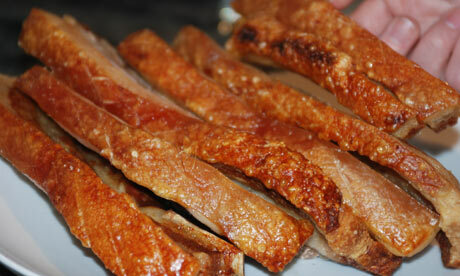 Posted on 3, January 2012, in Food and tagged British food, crackling, happy new year, pork, pork rind. Bookmark the permalink. 3 Comments. I can’t imagine what he did with the hairdryer? It is not anything he learned fom me.if it was good then he could teach me! Pleased it went well. Yorkshire puddings with pork.No!! Totally want to know more about the hairdryer & the pig! 🙂 Sounds intriguing & MacGyver-esque!